Recently, I went on a beach walk and did a one-hour beach cleanup. I started at the northernmost entrance to Spanish River Park, where there is limited street parking on Spanish River Road. I walked north towards Highland Beach. Overall, the beach was relatively clean, though there were a few concentrations of trash, and plenty of disturbing finds. Though it was overcast, it was an eerily beautiful beach day. The gray sky bled into the gray sea, and without the help of a sailboat I wouldn’t have been able to tell where the horizon was. The sea was also silent, a rare sight on the east coast of Florida. A piece of glass sticking straight up out of the sand. This was found in the park part of the beach, and is the reason why glass is prohibited on most beaches. I think this is a needle used for blood tests. It is hard to see in the picture, but if you look closely at the top of the teal plastic, you can see the needlepoint. Ouchies! A rusted, upturned bottle cap. Action Plan: Donating your time to a cause you care about is one of the greatest gifts you can give to both yourself and the world. Spending time cleaning up a beach or volunteering at a local nature center will allow you to spread your passion and inspire others. There are many different ways to help the ocean and environment, even if you are busy with a job or with a family. If you are financially able to donate, there are many great organizations that would welcome your financial support. Most environmental organizations are non-profits, and the success of their programs relies heavily on fundraising. Sometimes potential donors are apprehensive about donating to organizations and not knowing how the money will be spent. It’s always important to do your research, and there are websites like Charity Navigator that rate charities and provide in-depth reports as to how the funds are allocated so you can make sure your money is going to a reputable organization. Donating your skills is a great way give back while also building your portfolio. Maybe you are a fresh-out-of-college web designer or social media manager. A lot of smaller non-profits don’t have the time or the resources to keep their websites updated. Volunteer your services! You can help an organization, while getting a great piece for your portfolio. If you have a skill, volunteer it. There are many different ways to make this resolution a reality in 2016. What will you do? Let’s have a moment of silence for the 295 bears that were killed in less than 48 hours this past weekend. Each bear was taken by surprise, a victim in an unfair fight. We want to tell ourselves that we were relieved of these nuisance bears, that a threat to the fragile human species has been curbed for now. For most of the US, summer is winding down. Soon, the kids will be back at school and the heat and waves of summer 2015 will be a precious memory. But for those of you who are still planning beach vacations, who are venturing south for the winter, or who are lucky to live near the beach full time, here are six reasons why you should participate in a beach cleanup before summer is officially over (or really whenever you can)! Sea turtle season doesn’t end until October, so there are still plenty of hatchlings waiting to emerge and find their way to the ocean. We know that their journey is already hard enough, so let’s make sure that their path to the ocean is as easy as possible. 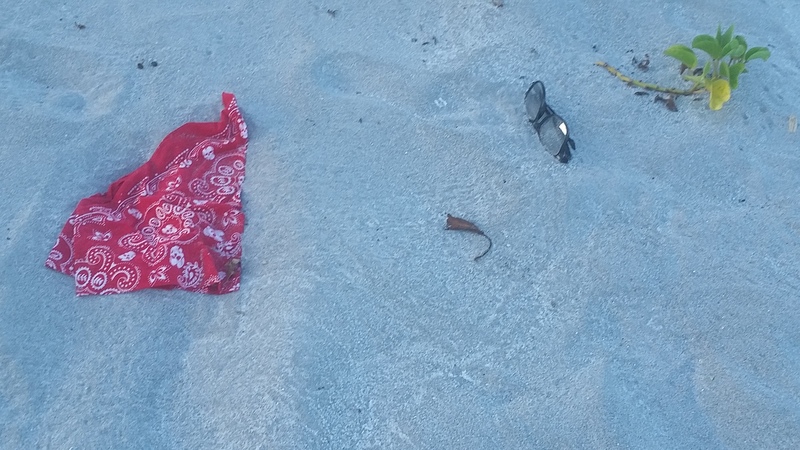 Despite sea turtle nests being marked off and protected, I always find a lot of trash around the nests. Not only does this litter pose a threat to the hatchlings, but it also threatens any shore birds that search the sand for their food. The tide brings in a lot of garbage, let’s make sure it doesn’t go back out! Whether you get a group of your friends together to go cleanup your favorite beach spot, or join one of the many great organizations that coordinates beach cleanups each month, you can make positive memories with friends old and new. If protecting the ocean and the environment is something you are passionate about, get outside of your comfort zone and join a group cleanup. It is a great way to meet other people who share your passions. I have met some of the nicest and friendliest people attending cleanups. People are always stoked to meet someone else who actively shares their passion for the environment! Carrying buckets of garbage in the sand is an excellent workout that is sure to get your heart pumping and your body sweating. If you don’t have a grabber, which I highly recommend if you plan on frequently doing beach cleanups, you will be doing a lot of squats to pick up garbage. Most organized beach cleanups last about two hours, a great amount of time for a workout out in the fresh, salty air. It’s a fantastic way to start the day! It’s easy to get caught up in our busy lives and get stuck behind our computer’s keyboard. If you want to see a difference in the world, be the difference. It’s as simple as that. Participating in a beach cleanup is a rewarding experience, and if you have never done one, I am sure you will be shocked by the amount of garbage you will find. Whether you are cleaning up the beach on your own or with a group, a beach cleanup is a great time to analyze your own choices when it comes to both consumption and disposal. When you actually see first hand the amount of garbage carelessly left behind, it may lead you to reexamine your own choices. Being conscious of our own consumption, and what happens to our own garbage can lead us to make changes that lower our own footprint. 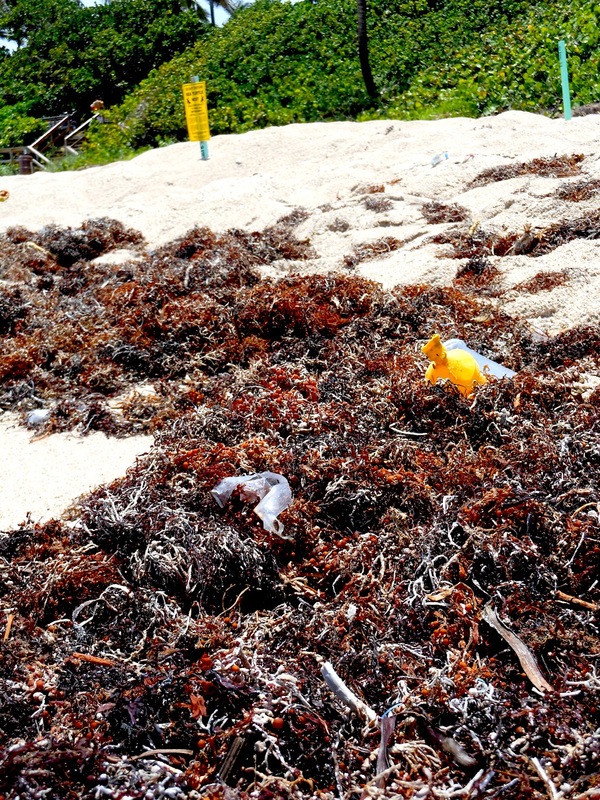 Raising awareness about the plight of the fragile shore ecosystems is important. Many people thoughtlessly extinguish their cigarette butts in the sand, and leave them behind, probably thinking it’s just me, no biggie. But when many people adopt this mentality, that is when the beaches become, for lack of a better word, gross. I think it’s a great idea to photograph garbage as you cleanup. Take pictures of the amount of cigarette butts you find, or the weirdest item you find. Then share, share, share! Share across all your social media platforms! People by nature are very visual creatures, so actually showing instead of telling is a fantastic way to raise awareness to the issue of beach litter. Maybe, just maybe, someone will think twice before leaving behind a styrofoam cup, or not disposing of fishing line properly because of an image or experience you share. Beach cleanups are a ton of fun, and even though summer is almost over, many groups organize beach cleanups year round. Whenever you get the opportunity, I strongly urge you to spend a morning or afternoon doing a beach cleanup! Also check out local meet-ups on Meetup.com. Be sure to mark your calendar for Ocean Conservancy’s International Coastal Cleanup on September 19th, 2015! If you run an organization that facilitates beach cleanups, feel free to comment with a link to your website! On November 4th, 2014, Florida voters will head to the polls to cast their votes in order to decide the future of the state. Amendment 1, the Florida Water and Land Conservation Initiative, is an important initiative voters will decide on. If you like clean water, then we recommend voting yes. Amendment 1 is our last chance to protect Florida’s fragile ecosystems. With climate change becoming more of a threat with each passing day, and the recent revelation that vertebrate populations have declined by more than 50% in just the last forty years, saving our planet and its plants and animals is something we can no longer wait for someone else to do. We the people must stand together, and by simply marking a ballot, we can choose to allocate more than $10 billion dollars to environmental conservation and water protection over the next 20 years, without any increase in taxes. Doing otherwise would be an irreparable act of negligence. Since 2009, the Legislature has cut funding for land and water protection by 95%! Because our government seemingly does not find clean water all that important, citizens took matters into their own hands to get Amendment 1 on the ballot. Florida’s Water and Land Legacy was established, and within a year and a half, they received more than 700,000 certified signatures that allowed Amendment 1 to be placed on the November 4, 2014 ballot. Provide funding to manage existing state and local natural areas, parks, and trails for water supply, habitat and recreation. The money that will allow this to happen will come from Florida’s excise tax on documents, or documentary stamp tax. This is an already established tax generated by documents necessary during the sale of real estate, and Amendment 1 will see to it that 33% of the funds raised by this tax will be used only for conservation purposes. This money will help Florida’s fragile ecosystems, and will combat both land and water pollution, helping to ensure clean and plentiful drinking water for this generation and those to come. If this Amendment does not pass, the future of Florida and its inhabitants will be at stake. The future of clean drinking water, of our beaches, and of tourism will be uncertain. Will our children know the beauty of the Everglades, will they know of manatees and Key deer, will they be able to traverse trails and play in parks? Let’s answer these questions ourselves, with action, with our voices. We can no longer rely on our legislators or representatives to do right by us and by the environment. We must do the checking and balancing. It is up to us to protect our state, our ecosystem, and all of the inhabitants within it, whether they walk on two legs, four legs, or none. We must take action, and the easiest way to do that is to Vote Yes on Amendment 1 on November 4th, 2014. The Beach Review celebrated the official first day of summer with our first beach cleanup at South Inlet Park in Boca Raton, Florida! We met on the morning of June 21st, 2014 with one mission in mind… fill up the bio-degradable trash bags and clean up the beach! What we found was disturbing. When you hear about beach cleanups from other people, you think you know what to expect; you think you will know what you will find. But as with most things in life, hearing about something versus actually doing it are two completely different things, and a beach cleanup is no exception. The best analogy that comes to mind of what a beach cleanup is like is the same experience that you have when snorkeling underwater. At first, nothing is there, but with a single blink of the eye, the creatures of the ocean reveal themselves to you- fish swim beneath you, swim next to you, swim all around you. With a beach cleanup, at first you look out at the glistening morning sand, the persistent, yet quiet break of the waves, and that is all you see. When you put your gloves on and hold that trash bag in your hand, suddenly things begin appearing, and before you know it, you are overwhelmed by the shear amount of garbage that is strewn carelessly about this paradise. 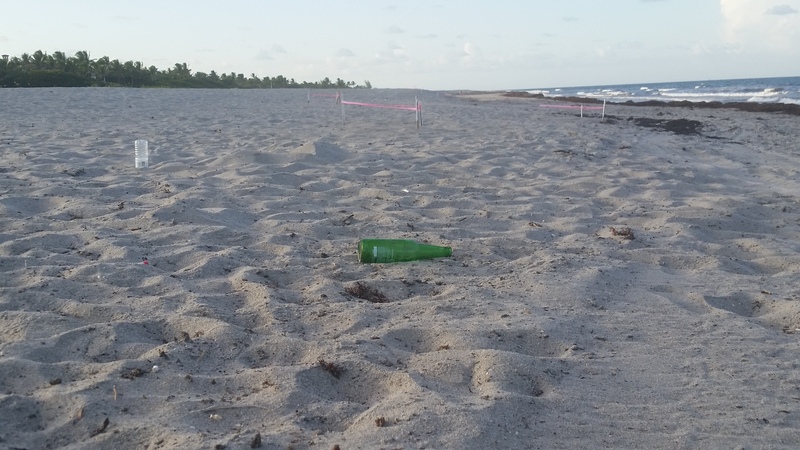 There are two glaring issues of this beach that seem to contribute to the amount of trash on the beach, besides the typical lackadaisical beach goer. 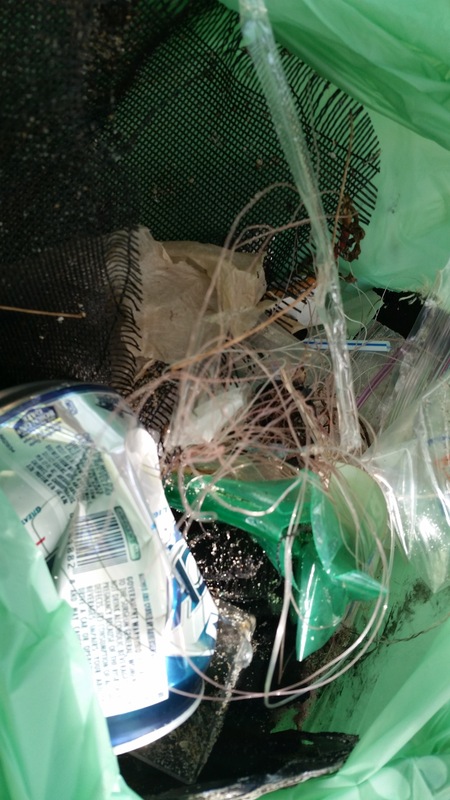 A mixture of fishing line, small plastics, and other litter. Fishermen flock to this location because of the ease of access to inlet fishing, which is basically a superhighway of marine life from the ocean into or out of the intracoastal waterway. The main problem with fishermen is fishing line. 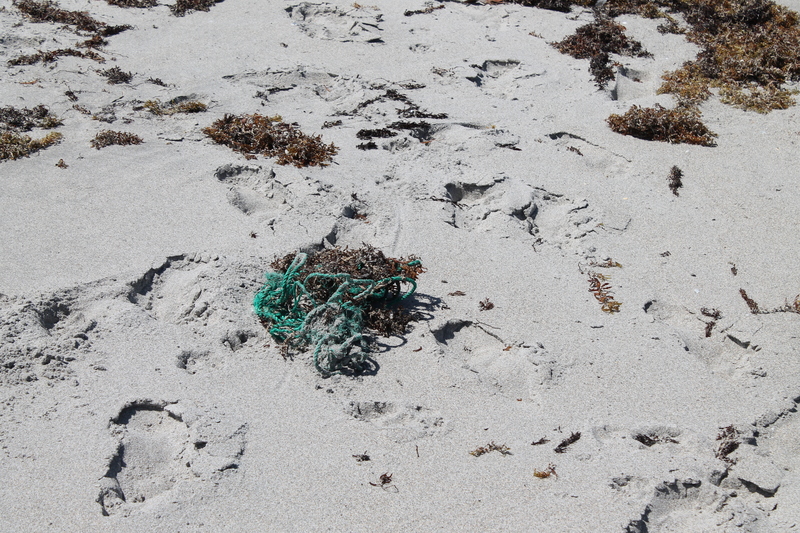 Fishing line takes 600 years to decompose, and is often mistaken as food by birds, manatees, and sea turtles. Ingestion of fishing line is often fatal. We found copious amounts of fishing line tangled in the jetty, left on the shoreline, and buried in the sand. Why? 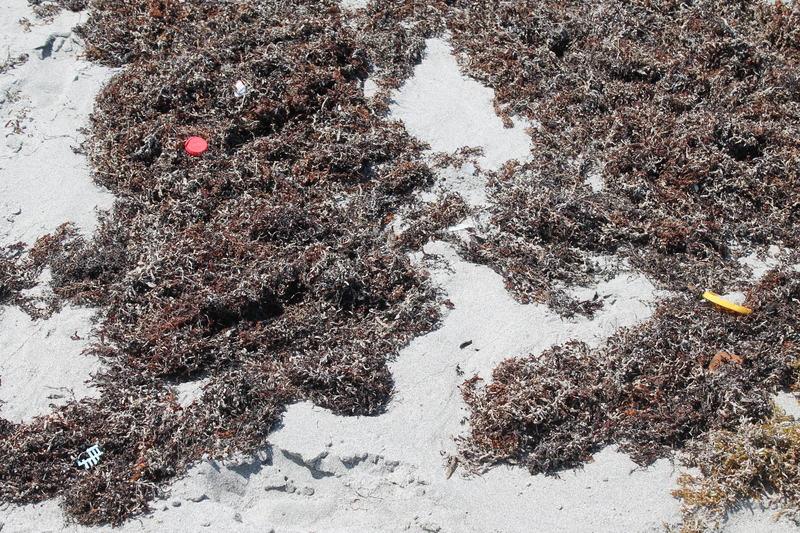 Yes, someone is just carelessly leaving it behind, but this beach does not have a fishing line disposal receptacle! A popular fishing spot with no fishing line receptacle? Ridiculous! 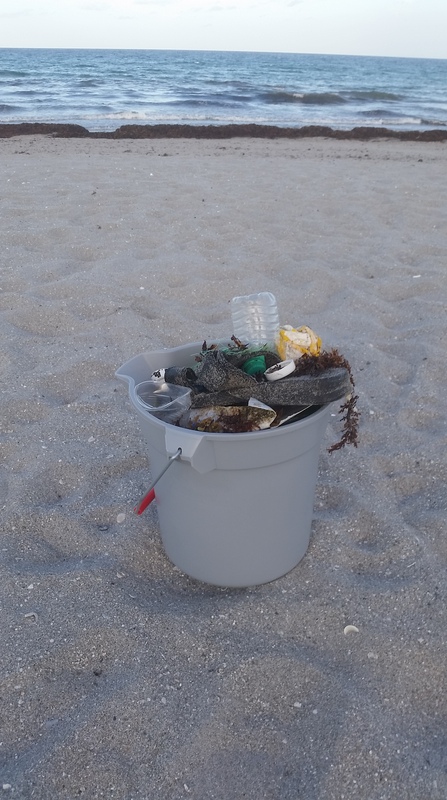 The Beach Review has contacted the Monofilament Recovery and Recycling Program (MRRP) that is run through the Florida Fish and Wildlife Conservation Commission in hopes of trying to get a proper receptacle there to hopefully curtail the frivolous disposal of fishing line. We will keep you updated on our progress. 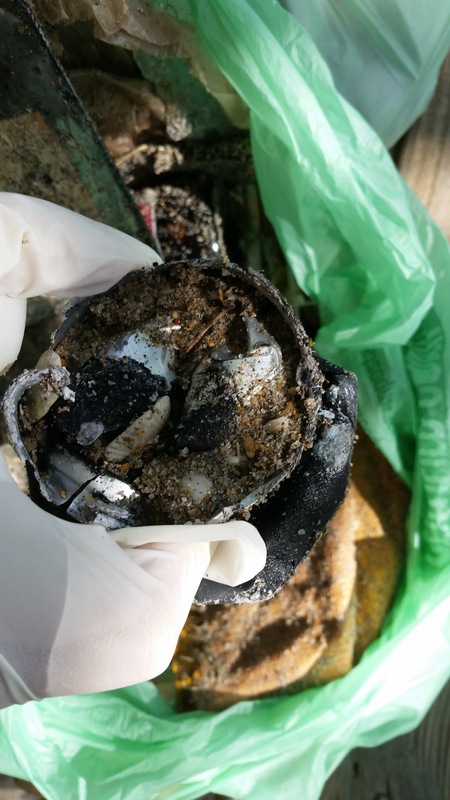 The only fishing line disposal location in Boca Raton that we found on the MRRP website is at 7 Seas Bait and Tackle at 1308 NW 2nd Avenue, Boca Raton, 33432. Please take your monofilament fishing line there so it can be recycled. An unrecognizable, mangled aluminum can, with very sharp edges. 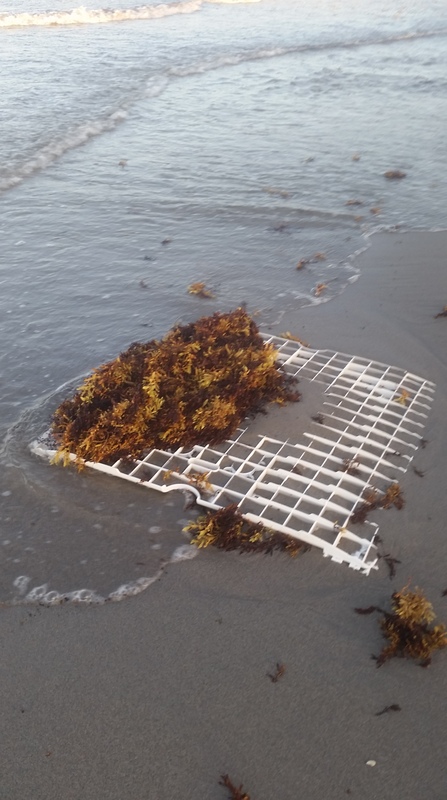 The “material dredged” is not just sand, but also any piece of trash that has been deposited into the ocean and found a temporary resting place at the bottom of the inlet. We found an unbelievable amount of trash that was thrown out of the dredge. How do we know it was from the dredge? Because of the location of the debris. When the dredge spews the sand etc. from the bottom of the inlet and then is turned off, it leaves a distinct pattern of wet sand and water runoff over the dry interior sand. It also appeared that the machine was shredding certain items, specifically aluminum cans. A whole aluminum can usually won’t cut someone’s foot, but shredded aluminum most definitely will. Most of what we saw were iceberg cans, meaning that you would pull a piece that was slightly protruding out of the sand’s surface, and instead of pulling a small piece, you would actually pull out a much larger piece that was hidden by the sand. Do not go near the dredge when it is on. It is an extremely dangerous machine and we saw first hand that it is not just sand and water coming out of it! What the dredge brings to the surface (literally) are past violations against nature. 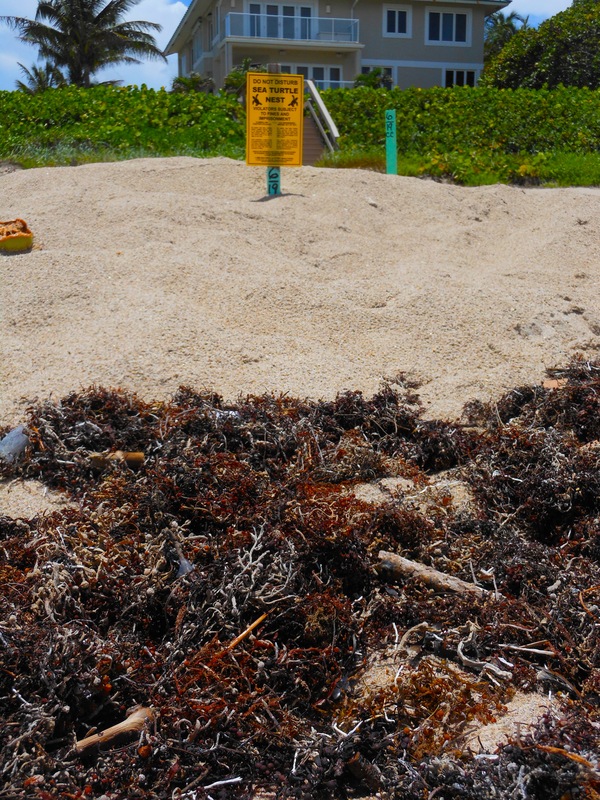 The area where the dredge is depositing materials should be given extra care by those who are responsible for the maintenance of this beach (it is run by Palm Beach County), or for any other group that wants to do a beach cleanup in this location. As dangerous as the trash on the beach is, it is a second chance to remove it from the environmental equation all together. Everyone should pay extra attention to the trash around them, because all it takes is a split second to step on the wrong thing, and your beach trip is ruined. The “find of the day” went to the abandoned baby doll. Small plastics, specifically straws, tops to children’s drinks, plastic silverware, etc. 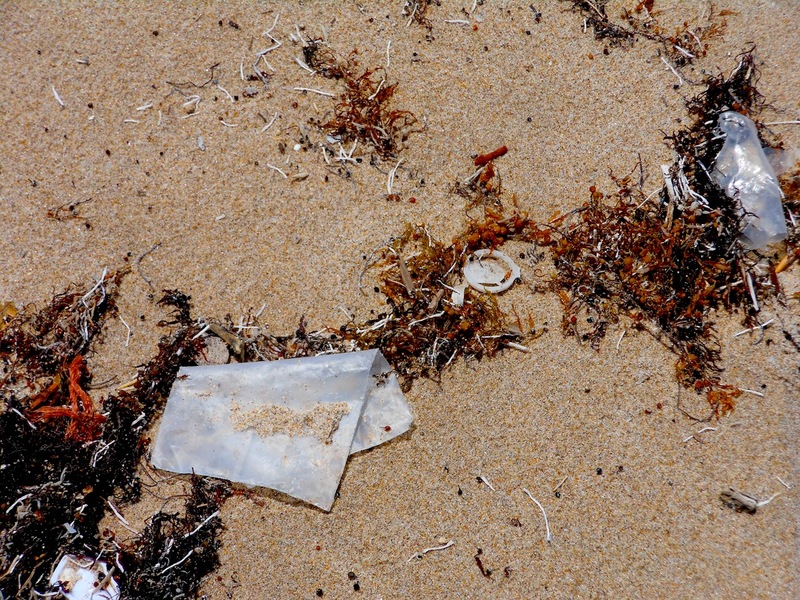 Small plastics are eaten by sea birds and turtles, and can cause them great harm by blocking their digestive tract. A closed plastic zip tie. As a human, I have struggled severing strong plastic such as this, so imagine what it would do to a bird or turtle. This is a twist off cap from a popular children’s drink. It is never too early to teach a child how to properly dispose of their garbage. This bag features a fantastic assortment of what we found, including the pick of the day. A piece of a broken fishing pole. More small plastics and fishing line. 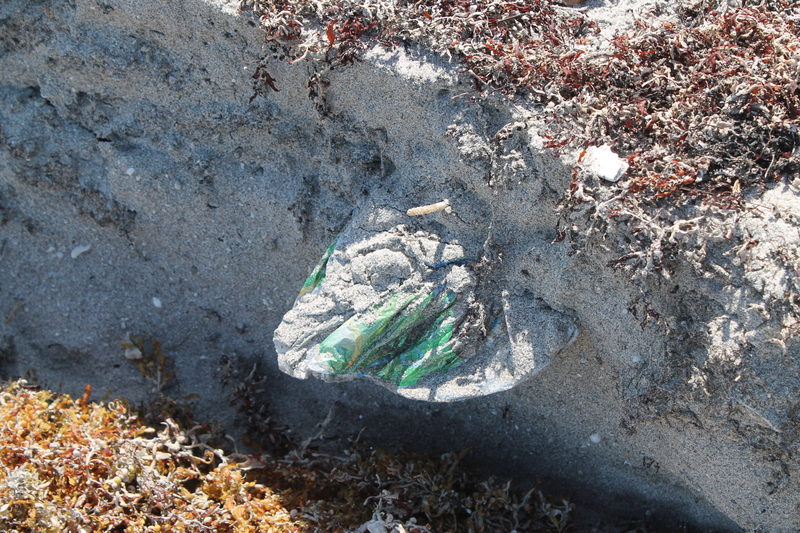 A styrofoam and plastic food package found in the dunes. The amount of garbage found within the first hour of the cleanup. On your next trip to the beach, be cognizant of what you are bringing with you and what you are leaving behind. Remember, you are a visitor in the full-time home of other beings. It’s a life or death journey that only one out of every thousand survive. It’s the moment to sink, or to swim. This is the trek of the hatchling. To humans, it is not a great distance from the edge of the sand to the ocean surf. To a baby sea turtle, this is the longest, most significant journey of their lives. Sea turtles lay their eggs, and then leave them behind forever, never knowing how many, if any, of their next-gen will make it to the sea. After incubating underneath the sand, the babies will hatch, and crawl just beneath the surface in unison. When the sand temperature is just right, the hatchlings will emerge from the sand, looking for visual clues to make their way to the sea. Meanwhile, natural predators standby waiting to feast on the disoriented hatchlings, picking off a significant portion of the hopeful swimmers. Hatchlings use clues such as the white caps of the waves and the natural light of the horizon line to adjust their course in the right direction. This is why human lights can be so detrimental to the hatchlings trying to find the ocean; streetlights, houselights, carlights, or flashlights can distract a hatchling from its natural path. Another issue for hatchlings is debris in their path. 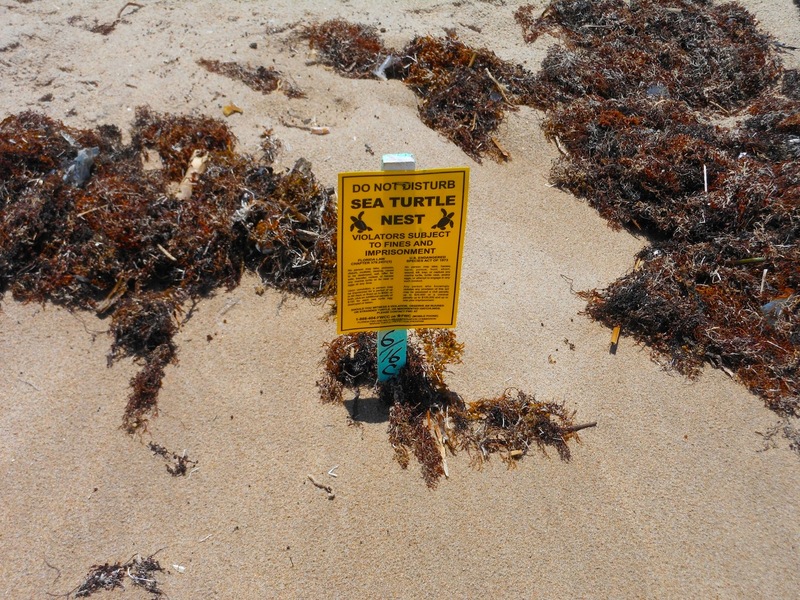 When a mother turtle dropped off her eggs, she probably chose a spot that was clear. Overtime with the changing tides, many different things, from seaweed to human litter, can wash up and ruin the hatchlings’ course. Below are some images that present different angles around a single protected sea turtle’s nest. It begs the question of how these tiny hatchlings will be able to make their way to the ocean against these physical obstacles. Zoom out and begin to see some of the trash mixed with the seaweed. Zoom further out to see the different types of plastics just feet away from the turtle’s nest. How will the hatchlings overcome this? Why does this have to be another obstacle on an already difficult journey? More plastic in the hatchling’s path. Think about where your trash goes. Don’t be the reason why 999 baby hatchlings won’t make it to the ocean. More than just water moves in and out with the tides. If you walk along the coast at low tide, whether you are near the ocean or the intracoastal, the water will leave behind a troubling portrait of its health, as if asking for help or even mercy. 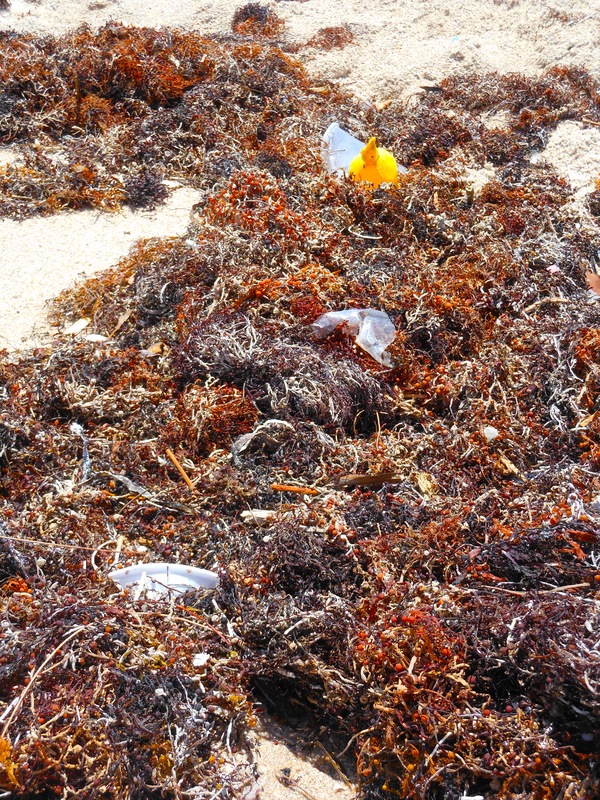 Moving with the currents is the trash that ends up in the waters, whether it originated directly from the beaches, from marine vessels, or from even further inland. Below you will see a small snapshot of what is occurring in the mangrove ecosystem. This photo was taken along the mangrove boardwalk at Gumbo Limbo Environmental Complex in Boca Raton. 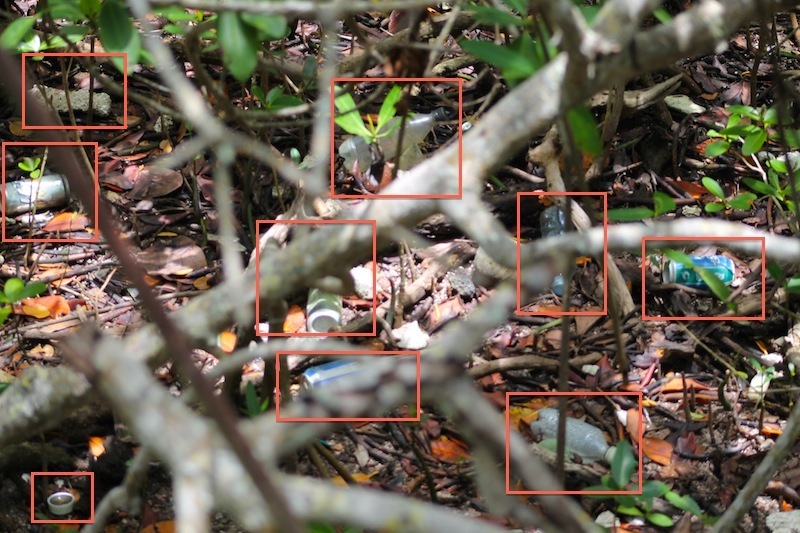 Each red rectangle shows a piece of trash that was deposited in the mangroves. In one small frame, we were able to capture nine pieces of trash. More than likely these were deposited here indirectly, meaning that someone probably wasn’t sitting in the mangroves drinking beer and bottled water. These were pushed into the mangroves and left behind by the high tide. The mangroves are home to many creatures, from birds to foxes, from crabs to spiders. They are safe houses for fish, crustaceans, and shellfish to reproduce. Snapper, snook, tarpon, jack, sheepshead, oyster, shrimp, and many other valuable marine species find their food amongst the mangroves. Pelicans and other coastal birds use the branches of the mangroves as their rookeries. What would you do if your neighbor put his or her trash on your lawn, instead of in the proper receptacle? Even if it was just a couple of cans, or a plastic bottle? You wouldn’t stand for it, so why should we stand for this treatment of a valuable ecosystem? Mangroves are important, fragile ecosystems that help protect coastal regions from erosion. Mangrove roots naturally filter the water from pollutants, but in no way can they self-regulate the trash that accumulates there. So… what can you do to help protect the mangroves? While you will see the occasional soda can, most cans you will see are beer cans. This happens because many people are drinking on the beach or on their boats, and when they become drunk, they begin to give little regard to the environment (amongst other things). Before you start drinking, have a trash disposal plan. 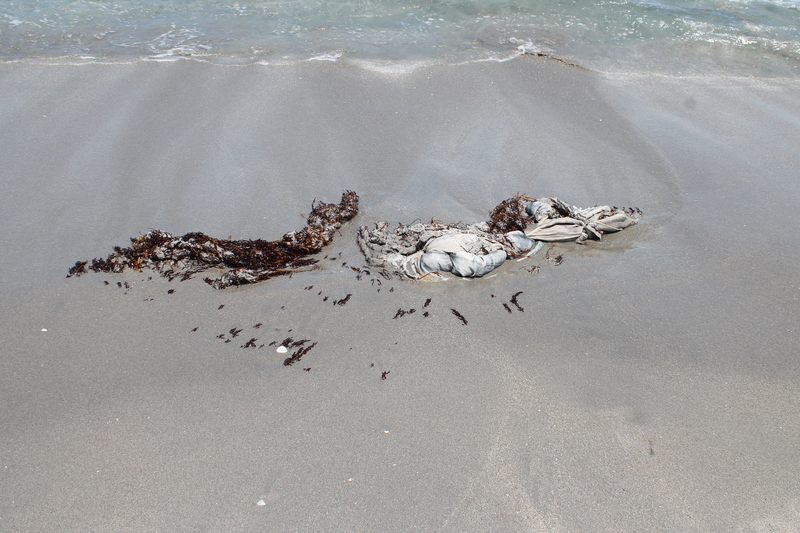 Make sure you bring bio-degradable trash bags with you to the beach or put some on your boat. If you have a cooler, put the empties in there so that when you return home, you can properly sort and dispose your recyclables. To minimize plastic bottles in the mangroves, use a reusable water bottle that you will take home with you instead of throwing it into the abyss. Abandon the out of sight, out of mind mentality. Nothing in this world just disappears, not your problems, and definitely not your trash. Friends don’t let friends become enemies of the environment. If you see your friend engaging in behavior that is hazardous to the environment, say, “Hey, friend, why don’t you throw that can over here to me, and I’ll throw it away for you?” If you don’t, then you are guilty by association. Think of the critters. Think of the baby chicks waiting for their parent to return to the nest with food, their cute little chirps, their eyes not yet open. Mama bird returns home, and as she goes to regurgitate the food into the hungry beaks of her chicklets, she chokes, she screams, she squawks. She falls over dead because she choked on a piece of trash, leaving her innocent little babies hungry and vulnerable to the mangrove predators. Our lives will come and go, and our trash and litter will remain. Leave more to your legacy than plastic bottles and aluminum cans. Let’s all work to protect the mangroves and its inhabitants.